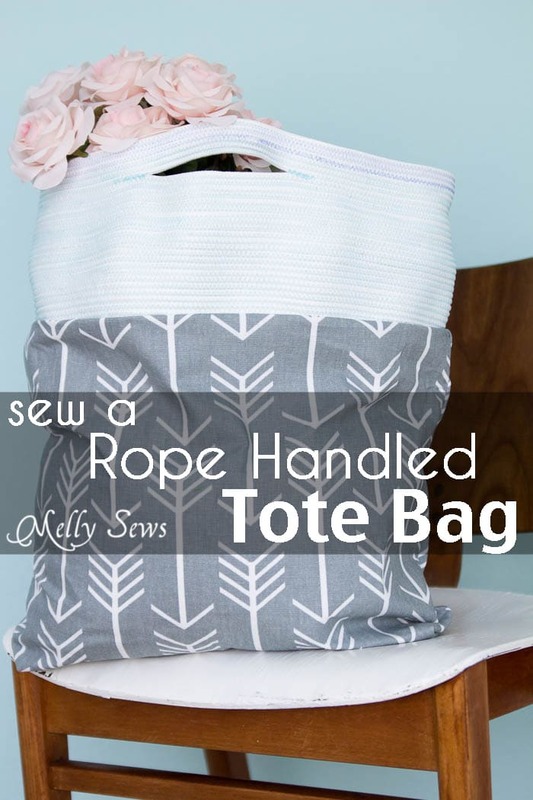 Hey y’all – today I’m going to share how to sew a tote bag with rope handles. It seems like things in the sewing world go in cycles, and lately I’m seeing a lot of rope bowls being sewn. I thought it was a super cool technique, but I just don’t think a rope bowl would do anything but collect dust in my house. But I still wanted to try the technique, and eventually realized this would be great to make the handles for a giant, sturdy tote bag! The kind that we all need in the warmer months, to carry sports gear or picnic supplies or even to use shopping at the farmer’s market. So let’s make one! To start with, you’ll need rope. I used polyester clothesline for mine, but as long as it’s rope you can stitch through (so not something super coated or metallic that would break your needle) and as long as the construction is sturdy (so not something like cotton cording that you typically insert inside piping) I think you could use any kind of rope. I used 100 feet exactly for this handle, which measures about 6 inches tall. You’ll also need about 1/2 yard of outer fabric, 1 yard of heavy interfacing or even something like Peltex, and 1/2 yard of lining fabric. Next, load up your bobbin and a few spares with your thread color. If you want the same color throughout, you’ll probably want 2 spools of thread; I used an entire spool and then had to switch colors on mine. If you want the stitching to be less obvious, choose the same color thread as your rope. And note – this project is probably not for perfectionists. In all those coils you’re bound to have overlapped stitches when you have to change thread (and those show up darker) and the rope may not lay perfectly flat in every instance, it’s a lot of stitches to take out if something happens to your tension so you may just sew over the loose area again, etc, etc. If those kinds of things set your teeth on edge, this is probably not the project for you. 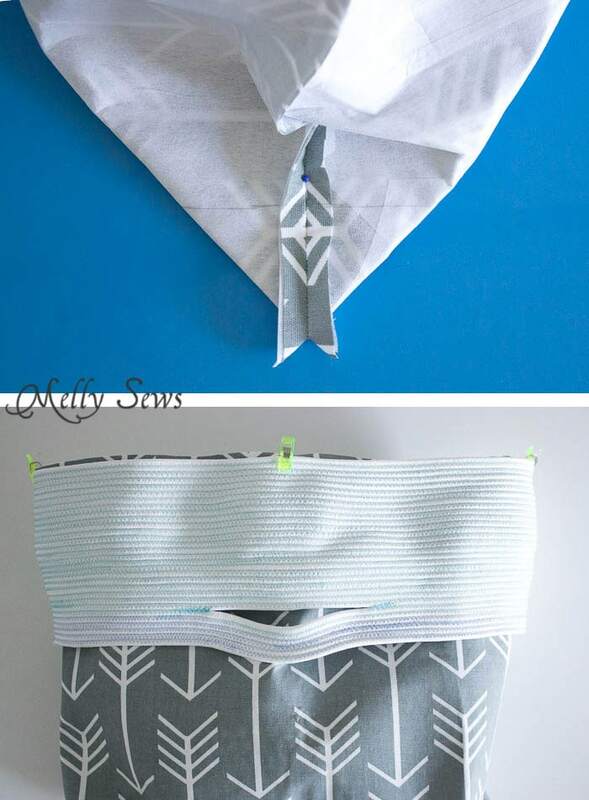 If instead you find variations charming and hand crafted, this is a very sewing zen project. To start, form a loop with your rope, overlapping the end. 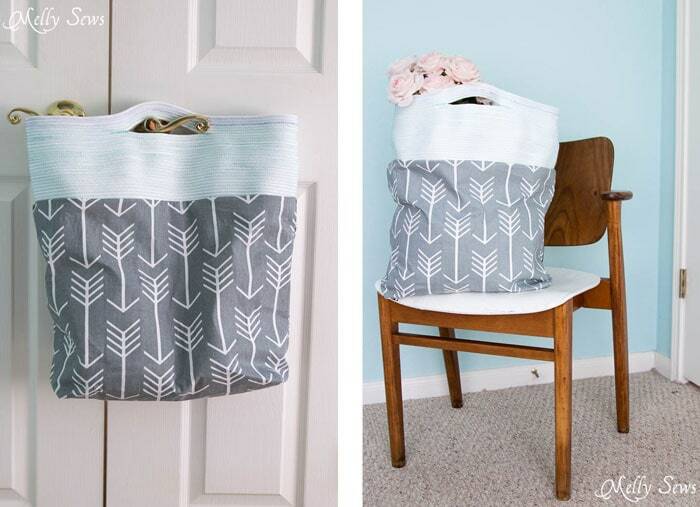 I knew I wanted my tote to be about 18 inches wide, so my loop is also about 18 inches wide. I used a pin to hold the end together to take this to the machine. 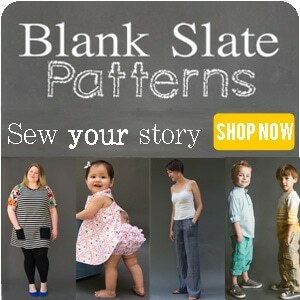 Set your machine to a wide zig zag with a medium stitch length. Mine was 4mm wide and 3.5mm long. Position the part where the two coils of rope touch at the center of your presser foot and stitch away! This is the zen part – there’s something soothing about holding the rope coils together and just stitching and stitching and stitching. When you have to change bobbins, overlap your stitching. When the handle is about 5 1/2 inches wide, stop with the needle down in your rope and pull the sides of the coil flat. Mark the ends with pins, then measure 2 1/2 to 3 inches to each side of each pin and mark – this is where you will put the openings for the handles. When you get to the first mark, stop and backstitch, then cut your thread and lift the needle. Push the rope apart from the coil a little, then back together at the next mark you made. Resume stitching, backstitching as you start for reinforcement. 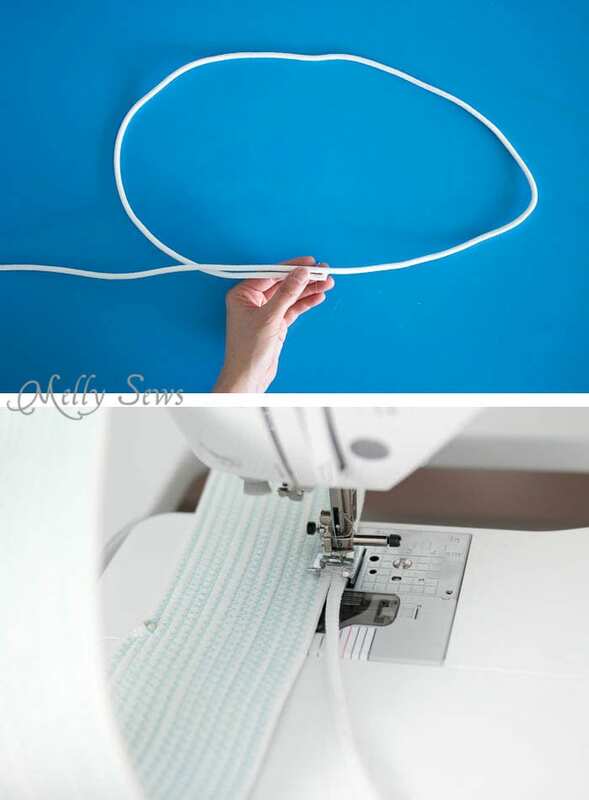 Repeat this process as your next set of marks, then just resume sewing in coils. As you get close to the end of your rope, make sure to end at the midpoint between handles and make sure each handle has the same number of coils in it. Lay your handle flat, and measure the width. Cut two pieces of fabric 18 inches tall and that width plus 1 inch for seam allowances. 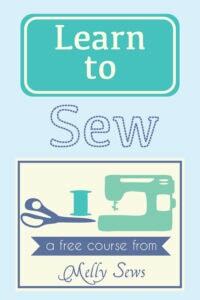 Repeat this with your lining and interfacing. Interface the main fabric, then place right sides together and stitch around 3 sides. Repeat with lining, but leave about a 5 inch gap in the bottom for turning the bag. Box the corners of the bag and the lining; I measured in 2 inches along the seam from the tip. If you’ve never boxed a corner, this tutorial has more pictures of the process. 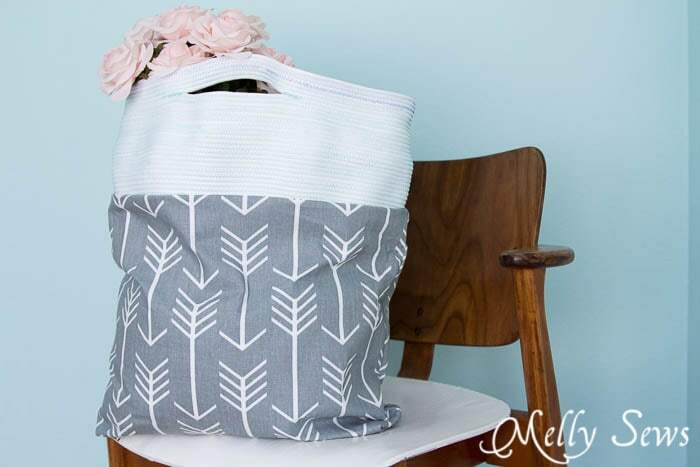 Side note: It might be fun to add some of the pockets from that tutorial to this bag, too. Turn the tote right side out, and place it inside the handle as shown above. I used wonder clips (affiliate link) to hold in place, as there was no way pins were going to hold this. You could also use binder clips or even paper clips in a pinch. Next, place the lining wrong side out over the entire bag and line up top raw edges. Secure with clips. 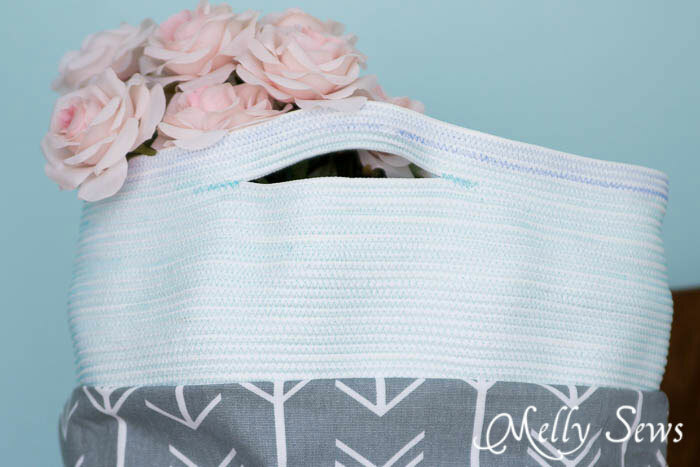 Stitch around the top of the bag, using the same zig -zag stitch you used on the coils. Turn the bag right side out through the gap in the lining, then stitch that gap closed. 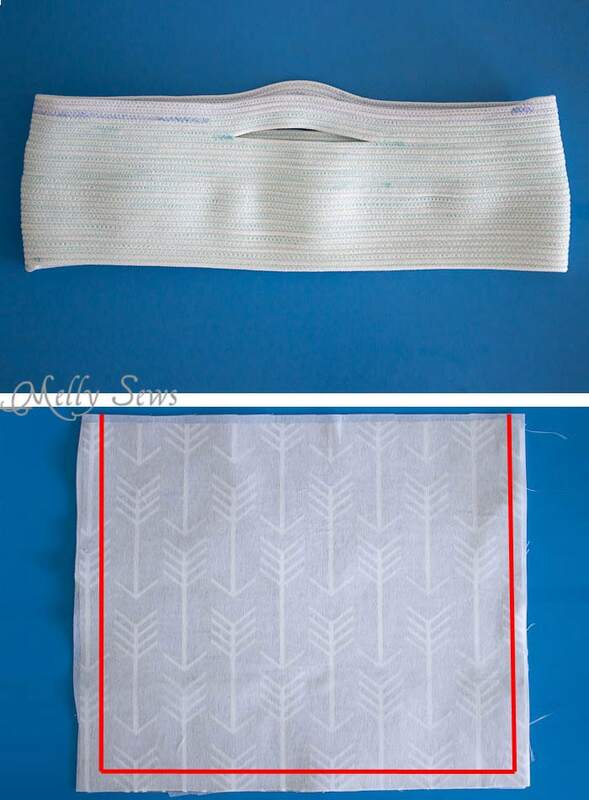 You can either fold the raw edges to the inside and topstitch close to the folded edge for a quick and dirty finish or blind stitch for a nicer one. Push the lining to the inside of your bag and you’re done! That is so clever and cool. Great idea and tutorial, thanks! 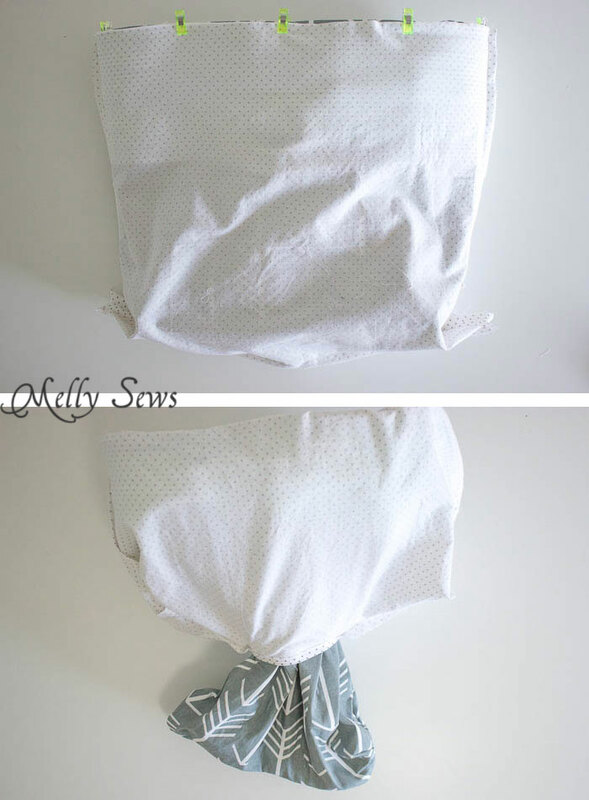 Added this to my project list and have all kinds of bags planned…now for all those pesky chores to disappear! This is really great, and inspiring. Thanks do much for the idea! What a great tutorial. I love the fresh idea of the rope top and handles. You have made this look so simple. It is therapeutic to try something new! This looks great. Definitely going to try it.